These processors and equipment manufacturers are shining a light on efficiencies and improvements in meat and poultry production. Raw material variability is one of the distinguishing traits of food production, and animal-based products provide a prime example of that reality. As a result, the processes for beef, pork and poultry pose a particular challenge for automation. The metric for judging automation traditionally has been labor savings: If a machine displaces enough manual work hours to generate an acceptable ROI, capital is made available. But the cost of workplace injuries also needs to be considered, causing meat and poultry processors to look at automation spending in a different light. Spinal column removal from primal cuts poses particular danger to workers in a beef fabrication room, with workers’ fingers within inches of a band-saw blade as they guide it as close to the bone as possible to remove the least amount of meat. When Steve Dunivan began in-plant trials of his smart-rib butchering system, he received a particularly warm reception from the band-saw operators: “Almost every person can show you a scar,” he says. Dunivan, owner of Midwest Machine LLC, Amarillo, Texas, has worked on automating the rib cut for four years. Early versions of the machine simply couldn’t deliver the precision the job requires. About 18 months ago, he began discussions with Hermary Opto Electronics Inc., a Coquitlam, B.C., supplier of 3D vision systems. Hermary’s roots are in the lumber industry, explains Wes Henderson, director-business development, and its “sheet of light scanner” is hardened from years of industrial use in sawmills. By November 2013, Dunivan had written the coding to integrate the 3D system with his saw and began in-plant trials at Cargill’s Schuyler, Neb., facility. Since then, more than 1.2 million spinal cords have been precisely removed. Hermary’s camera triangulates on an object, taking up to 1,000 scans per second. That’s more than the rib-saw system requires and would unnecessarily slow processing speed. Dunivan dialed down to 200 scans a second, enough to produce a geometric rendition to guide two saws cutting within a 1/16th in. tolerance. Anything outside that is considered a bad cut, and a 1 oz. loss in yield per piece could cost a high-volume plant $750,000 a year. Dunivan's latest machine delivers good cuts 99 percent of the time, compared to 90 percent in the earliest versions and 70 percent with manual cuts. A mock-up of a beef rib passes under a yolk housing the SL-1880E 3D scanner, which interfaces with the controls for an automated saw. Trials are continuing of a system that automates spinal-cord removal from beef primals. Hermary is a Rockwell Automation partner, Henderson emphasizes, which simplifies data download via Ethernet/IP to MES or ERP programs for tracking and management reporting. Machine vision also plays a critical role in a poultry system developed by Gainco Inc., though worker productivity, not safety, is the goal. In this case, 3D imaging was an outgrowth of a robotic cutting system for chicken breast meat. The robot’s axes of motion never matched the performance of humans, but in the course of his work, John Daley, principal research engineer at Atlanta’s Georgia Tech Research Institute, discovered a way to calculate the amount of meat left on a chicken carcass, or frame, to determine yield loss. GTRI licensed the technology to Gainco, which followed up with a prototype machine shown at 2014’s International Production and Processing Expo (IPPE) in Atlanta with a ready-for-primetime version at this year’s show. By placing the frame on a translucent cone, Daley found that the intensity of LED lightwaves transmitted through it could be read by a near-infrared sensor to determine the amount of meat and bone present. Based on the grams of meat in five locations, a Yaeger Gore standardized score is computed of yield loss, according to John Daley (no relation), sales and marketing director at Gainco, Gainesville, Ga.
Poultry processors routinely conduct scrape tests to evaluate operator performance, Gainco’s Daley says, but it’s a manual process with a spoon-shaped knife and takes five minutes or more. Meat remaining on the frame will be recovered downstream in the MDM process, but its value is significantly lower than the white breast meat captured on the cone line. He characterizes his rapid yield analyzer as an instructional tool, providing quick feedback to operators who exceed the target loss level and identifying where on the frame the most meat is being left. A handful of processors field tested the prototype design and made recommendations before Gainco fabricated the washdown ready version with an IP69 enclosure displayed at IPPE this January. International visitors were unimpressed, but half the domestic poultry companies expressed interest in conducting trials, says Daley, a reflection of the high volumes and efficiency focus in U.S. poultry processing. Different segments of the electromagnetic spectrum come into play in end-of-line inspection. 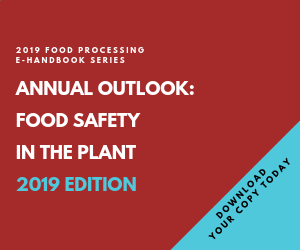 Whether they use metal detectors or X-ray units, meat and poultry processors must deal with the trade-offs between sensitivity and false positives, including overlapping products, observes Todd Grube, inspection product manager at Heat and Control Inc., Hayward, Calif. While Heat and Control doesn’t manufacture X-ray or metal detection systems, it serves as North American distributor and system integrator for two premium OEMs: Italy-based CEIA for metal detection, Japan's Ishida for X-ray. The MS-21 metal detector’s distinction is its simultaneous and continuous use of multiple frequency spectrums, a feature particularly useful in detecting finite particles of ferrous and nonferrous metals without increasing false rejects in conductive materials, such as moist meat. The Ishida IX-G2 X-ray system manages the same balancing act with its dual-sensor configuration. Plus, it detects low-density contaminants other than metals. Bone fragments are a big concern with all protein foods, Grube notes, and the first question from meat and poultry processors is the machine’s ability to detect bone or, in the case of seafood, shells. Cost remains a barrier to an X-ray upgrade, and unless customers goad them to make the transition, protein processors stick with metal detectors. “Unless they get complaints from customers about bones or some other contaminant that only X-ray can detect, protein companies are satisfied with metal detectors,” Grube says. USDA’s long-held position is that bone particles under 1cm long do not pose a safety hazard, and fragments up to 2cm are considered low-risk hazards. Regardless of size, chicken bone is hard to detect because of its low levels of calcium. In developing IX-G2, Ishida engineers specifically focused on poultry bones. The result is a machine that comes close to matching the performance of specialized bone-scan systems, with the added functionality of detecting other contaminants. “Bone detection is a driver,” concurs Dave DiPrato, and he salutes the development work of Marel that enabled the firm to deliver an X-ray system capable of detecting chicken-bone fragments. After some false starts a decade ago, Marel was able to consistently detect bones with minimal levels of calcium, enabling it to dominate the segment. DiPrato recalls the frustration in tackling the challenge on behalf of Tyson a quarter century ago, well before he founded Novus X-Ray in Blue Bell, Pa. “It is now doable,” he adds, and his firm is considering developing its own solution, but the technology comes at a premium above conventional X-ray. IP69 enclosures help, but returning a sophisticated machine to service after a breakdown often is beyond the expertise of plant personnel. His solution is a four-module X-ray unit. Once the problem area is identified, maintenance workers simply swap out the failed component and resume operations. Vision of a different kind is occurring in high-volume, automated sous vide production. Cincinnati-based SugarCreek Packing Co. is installing a 360,000 lb. per day capacity line in a manufacturing facility currently under construction in Cambridge City, Ind., 60 miles east of Indianapolis. A French term meaning under vacuum, sous vide is trending somewhere on Twitter, with home-kitchen versions muscling onto retail shelves next to the Cuisinarts. Commercial units started going into production 50 years ago in Europe, but they were relatively low volume systems requiring manual intervention. By and large, sous vide was the province of culinary chefs until this century. The German firm Armor Inox began fabricating automated systems with 100,000 lb.-plus capacity 15 years ago, and the biggest systems have landed in America, cooking hams, deli logs and other molded meats. Smithfield installed two of the company’s Thermix lines in a North Carolina plant in 2009, with a daily capacity of 660,000 lbs. of 5-ft. deli logs and other products. The SugarCreek project signals a mainstreaming of the technology, inasmuch as the firm’s focus is copacking and contract manufacturing. Installation of 10 batch tanks with 12,000 lb. capacity each began this month at the Indiana plant, with a July production start-up targeted. Product in sealed bags or molds will be immersed in water for 1-24 hours, emerging as ready-to-eat food. Whole muscle meat for foodservice likely will fill the early production schedule, says Sean Daly, SugarCreek’s corporate chef, but seafood, vegetables and other foods are among the dozens of test runs he’s conducted in the firm’s 500 lb. pilot-plant tank in the last year. Consistent cook temperature within 0.1° of set point is delivered, and there is a hard stop to cooking when the hot water is drained and cold water is introduced to the tank. Color retention, nutritional value and flavor are comparable to aseptic and other advanced technologies. Interest in natural ingredients and clean labels bodes well for the process, Daly believes. Whether clients market the products as sous vide or simply fully cooked, SugarCreek is betting the plant, if not the farm, on this process advancement. For the meat-averse, manufacturers are happy to provide vegetarian versions of familiar foods such as sausages and links. That precludes the use of natural and collagen casings and may require a more costly alternative to maintain sausage integrity. A more economic option is an alginate casing. That helps explain industry interest in the Vemag CC215 coextrusion machine introduced by Robert Reiser & Co., Canton, Mass. Two low-pressure Vemag units provide a constant feed to the CC215, one pumping the meat analog (or actual meat, for regular sausage), the other delivering the vegetable-based alginate. Once extruded, the formed sausage is sprayed with a calcium chloride solution to fix the alginate. Portioning rates for a breakfast sausage are about 720 pieces per minute. Interest in both meatless ingredients and clean labels bodes well for coextruded sausages and sous vide cooking.